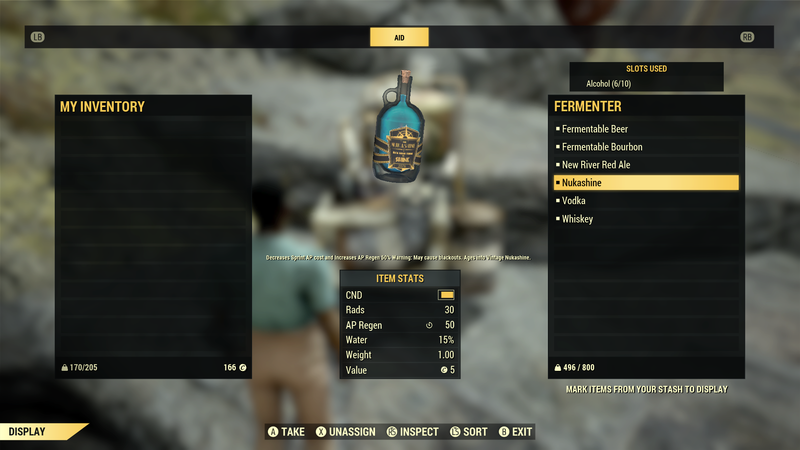 The biggest new addition is a quest called Wasted on Nukashine that encourages you to perfect the art of brewing some Nuka-Cola-infused hooch for a drunken robot named Biv. This robot, by the way, has spent the last few decades stumbling about in the basement of a tattoo parlor that had been converted into a speakeasy by some students at the nearby university who were tired of the cops constantly busting up their keggers. The setup is sort of like Animal House meets Weird Science, minus all of the teenage perviness or other characters. Like previous quests in the game, most of the story is relayed through computer terminals, hand-written notes, and old holo-tapes. It’s entertaining and at times funny, but it’s also shallow. 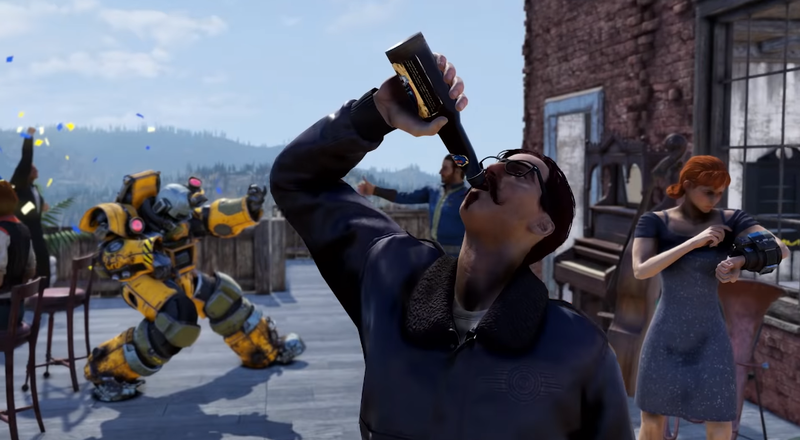 It doesn’t offer a deeper window into Fallout 76’s world, unlike some of the better quests from the main campaign like discovering what happened to the girl at Riverside Manor or the main beat in the Overseer’s journey. . What it does do, however, is provide you with the means to make your own booze by way of a new crafting station, the blueprints for which you receive from the robot after you complete the quest. This new booze system is the real draw. At the start you can make a handful of beers, wines, and liquors using ingredients like corns, wheat, and boiled water. Once you finish compiling the ingredients for a given drink, it needs to be placed in a fermenter for a certain period of time. The longer it sits there, the stronger its effects become. You can even place other bottles of booze you’ve found during your travels into the fermenter to age them as well. The effects go beyond just drunkenness. Drinking the aged version of Firecracker Whiskey, for example, will allow you to set enemies on fire when you attack them. This is effectively a potion system, with the option to get more new recipes by completing daily challenges for Biv. And since it’s all alcoholic, there’s no need to worry about it spoiling. The update also rebalances energy weapons to try and make them more useful. After fiddling around with them for an hour, it’s clear to me that they’ve gotten better, but they still feel like more trouble than they’re worth. Improvements like a 10% buff to semi-automatic energy weapons are nice to see, but that’s probably not going to fundamentally shift the existing balance of power in favour of them. Across the dozens of changes, there are a few other interesting additions, like the ability to craft radios for your campsite. This goes a long way toward making them feel less lonely. Bethesda has also added a reporting system into the game’s social menu to provide another option for dealing with people who are harassing or griefing other players, beyond just blocking them or hopping to a new server. The new update also makes it so that every legendary creature is guaranteed to drop a legendary item when it dies, which, well, finally. 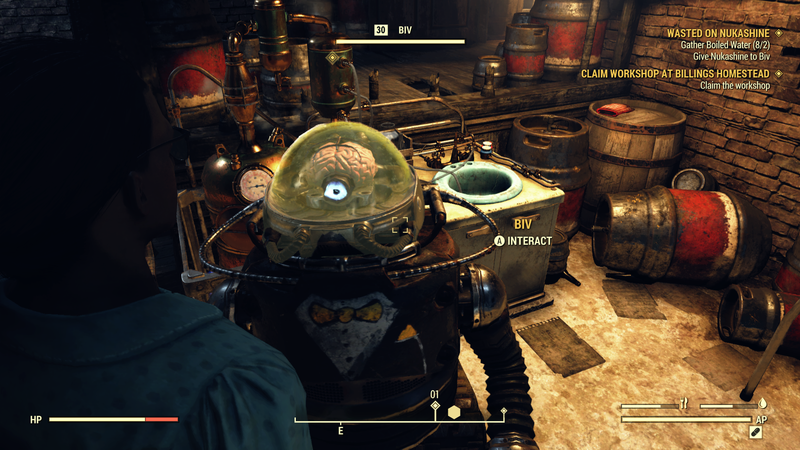 While getting new content, good balance tweaks, and continued quality-of-life improvements is all swell, but it can still sometimes be a struggle to play Fallout 76, at least on Xbox One. While checking out today’s update, my game froze once, and there’s still a ton of stuttering and pop-in after loading up the game for the first time and occasionally when fast-travelling to new locations. The game is infinitely more playable than it was at launch, but it still has noticeable struggles with performance. There are still quite a few more updates planned for the coming months, though, including the addition of a new, harsher PVP mode on March 26 and personal vending machines players can use to sell stuff to one another on April 9. I don’t know if any of those upcoming additions will ever be able to fill in the narrative void at the center of the game, but I’m glad to have a fresh set of reasons to come back and visit. Was a heap of people on my server all doing the quest at the same time as me! It was quick but fun! Server stability and load times seem quicker for me too. Camp budget has appeared to have doubled. I had built a trash palace which took the whole budget just before the update, and now the budget bar is half empty. "minus all of the teenage perviness or other characters"
You mean the stuff that made those movies great. The new quest line is definitely shallow, easily completed in a single sign-on session. Too little, too late... discuss!